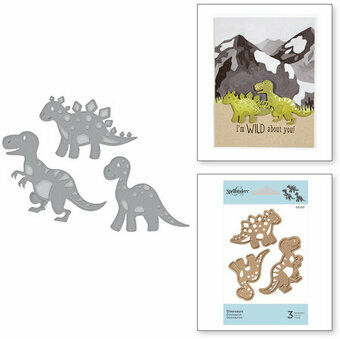 Die D-Lites Dinosaurs Etched Dies set offers three different dinosaurs that have detailed embossing designs to either ink or add medium through the dies. Spellbinders Die D-Lites cut, emboss and stencil with a single die template. Approximate Size: Dino1: 1.75 x 1.62 in. 4.40 x 4.20 cm, Dino2: 2.10 x 1.30 in. 5.30 x 3.30 cm, Dino3: 2.40 x 1.75 in. 6.10 x 4.40 cm. Die D-Lites Bugs Etched Dies set includes four different bug shapes. Spellbinders Die D-Lites cut, emboss and stencil with a single die template. Approximate Sizes: Bug One: 0.90 x 1.35 in. 2.20 x 3.40 cm, Bug Four: 0.95 x 1.75 in. 2.40 x 4.40 cm, Bug Three: 1.05 x 0.90 in. 2.70 x 2.30 cm, Bug Two: 1.45 x 0.90 in. 3.70 x 2.30 cm. 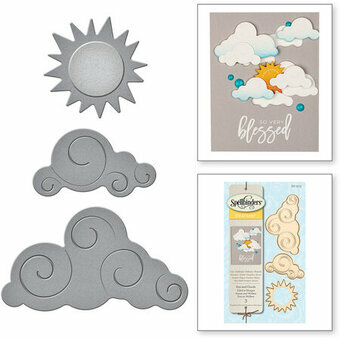 This Die D-Lites Sun and Cloud Etched Die set would make an awesome addition to your die cutting collection. The set includes two sizes of emboss detailed clouds and sun. Spellbinders Die D-Lites cut, emboss and stencil with a single die template. Approximate Size: Sun: 1.40 x 1.40 in., Small Cloud: 1.50 x 1.10 in., Large Cloud: 1.40 x 2.50 in. Christmas themed dies featuring Christmas lights. Part of the 2016 Holiday Collection. Enjoy seasonal favorites year round and let the magic of the holidays create memorable keepsakes that will last for generations. Spellbinders Shapeabilities Die D-Lites cut, emboss and stencil with a single die template. A string of lights with three loose bulbs to layer and make a dimensional accent on your holiday projects. Lights: 3.50 x 2.25 in, Bulbs: 0.45 x 0.65 in (3 pcs). A beautiful elegant vase! Perfect complement to S3-206 Asters and Poppies and S3-207 Blue Bells and Lily of the Valley die templates that can be displayed in this vase. Spellbinders Shapeabilities Die D-Lites cut, emboss and stencil with a single die template. Approximate Die Template Sizes: Inset: 1 3/8" x 3", Border: 1 5/8" x 3 1/8". Die D-Lites Snowman Etched Dies 2018 Christmas brings a smile with this set of six dies! Create a whimsical face to add to your holiday projects. Spellbinders Die D-Lites cut, deboss, emboss and stencil with a single etched die template. Approximate size: Snowman: 1.80 x 1.25 in 4.57 x 3.18 cm, Face: 1.65 x 1.45 in 4.19 x 3.68 cm, Scarf: 1.70 x 0.85 in 4.32 x 2.16 cm, Holly: 0.95 x 0.95 in 2.41 x 2.41 cm, Nose: 0.55 x 0.30 in 1.40 x 0.76 cm, Eyes: 0.30 x 0.30 in 0.76 x 0.76 cm. Die D-Lites Celebrate Etched Dies. Spellbinders Die D-Lites cut, emboss and stencil with a single die template. This Die D-Lites Celebrate Etched Die set would make an awesome addition to your die cutting collection. The set includes Celebrate, balloon and balloon string. String: 0.35 x 1.85 in, Balloon: 0.90 x 1.20 in, Celebrate: 3.00 x 0.95 in. Die D-Lites Make a Wish Etched Dies. Spellbinders Die D-Lites cut, emboss and stencil with a single die template. This Die D-Lites Make a Wish Etched Die set would make an awesome addition to your die cutting collection. The set of four includes Make, a, Wish and a candle stick. A: 0.45 x 0.45 in, Candle: 0.30 x 1.70 in, Wish: 1.55 x 1.20 in, Make: 1.65 x 1.30 in. A set of two opposite facing corners with delicate designs will bring beauty in any corner or create a delicate accent. Spellbinders Shapeabilities Die D-Lites cut, emboss and stencil with a single die template. Approximate Die Template Sizes: Left Inset: 2 3/8", Left Border: 2 5/8", Right Inset: 2 3/8", Right Border: 2 5/8". Spread Christmas cheer with this six piece set of words, use together or separately to make it your own. Make them pop with foil or glitter paper! Spellbinders Shapeabilities Die D-Lites cut, emboss and stencil with a single die template. Approximate Die Template Sizes: Joy: 7/8" x 5/8", Noel: 1 1/4" x 1/2", Happy: 1 5/8" x 3/4", Holidays: 2 1/8" x 3/4", Merry: 1 5/8" x 5/8", Christmas: 2 1/2" x 5/8". Die D-Lites Build a Panda Etched Dies is a set of eight dies that can have your panda in a standing or sitting position. An adorable set to add to your next project. Spellbinders Die D-Lites cut, emboss and stencil with a single die template. Approximate Size: Nose: 0.20 x 0.11 in. 0.40 x 0.30 cm, Eyes: 0.30 x 0.40 in. 0.70 x 0.90 cm, Hands: 0.35 x 0.71 in. 0.80 x 1.80 cm, Ears: 0.45 x 0.40 in. 1.10 x 1.00 cm, Feet: 0.50 x 0.65 in. 1.10 x 1.60 cm, Bow: 0.80 x 0.40 in. 1.90 x 1.00 cm, Body: 1.02 x 1.30 in. 2.60 x 3.30 cm, Sit Down Body: 1.50 x 0.90 in. 3.70 x 2.30 cm, Panda Face: 1.80 x 1.30 in. 4.00 x 3.20 cm. Spellbinders Die D-Lites cut, emboss and stencil with a single die template. Use them in your cards, tags, scrapbook pages and more! This three piece oval shaped set has edged designs of scallops to dots that will frame or accent any card front or tag. Approximate Size: Pierce Oval: 2.50 x 3.25 in, Oval Frame: 2.00 x 3.00 in, Tag: 1.00 x 2.00 in. Die D-Lites Happy Birthday Etched Dies. Spellbinders Die D-Lites cut, emboss and stencil with a single die template. 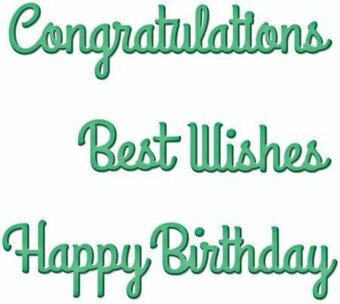 This Die D-Lites Happy Birthday Etched Die set would make an awesome addition to your die cutting collection. The set of two includes Happy Birthday and a cupcake ensemble. Cherry: 0.25 x 0.55 in, Liner: 0.70 x 0.25 in, Frosting: 0.80 x 0.50 in, Happy: 1.45 x 0.85 in, Birthday: 2.10 x 0.90 in. Die D-Lites Hello Etched Dies. Spellbinders Die D-Lites cut, emboss and stencil with a single die template. This Die D-Lites Hello Etched Die set would make an awesome addition to your die cutting collection. The set includes Hello, phone and dial. Dial: 0.50 x 0.50 in, Phone: 1.30 x 1.10 in, Hello: 2.10 x 1.45 in. Die D-Lites Love & Flowers Etched Dies Great, Big, Wonderful World Collection by Sharyn Sowell is a sweet silhouette of a girl and boy holding a sunflower in the center. 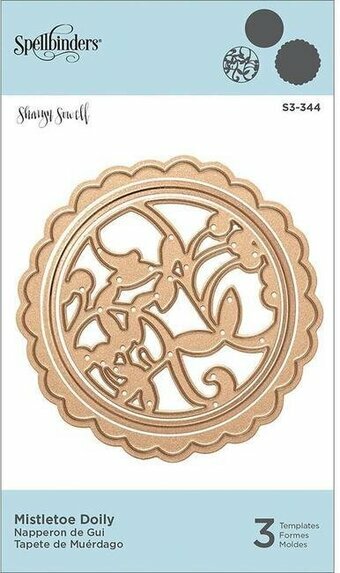 This Die D-Lites Fretwork Accents Etched Die set would make an awesome addition to your die cutting collection. Spellbinders Die D-Lites cut, emboss and stencil with a single die template. Use them in your cards, tags, scrapbook pages and more! Although a set of two dies, this a large accent piece. Nest the insert die to cut out the center. Approximate Size: Accent: 3.05 x 3.05 in, Insert: 0.75 x 0.75 in.